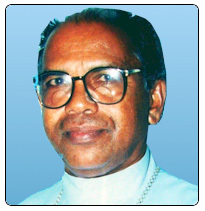 Bishop Joseph Kunnath was born on 2 September 1939. After his High School Education he joined the CMI Congregation and made his first religious profession on 16 May 1961. He took his graduation - B.Sc. from Bangalore in 1968 and B.Ed. from the Osmania University in 1969. He was ordained priest on 24 April 1972. After his ordination he has served as priest-in-charge of Mandamarri, Manncherial, Adilabad, Rallametupalli/Saligaon. He also worked as the Head Master of Carmel High School, Mandamarri during the period 1974-82. From 1981-84 he was the CMI Provincial Councillor, from 1990-96, the General Councillor. He was nominated Bishop of Adilabad on 16 July 1999 and was ordained Bishop on 6 October 1999.